Having chosen Katy Perry as our artist, we then looked at her latest album 'Teenage Dream' for an unreleased single. We chose the song 'One Of The Boys' because there is a story line to it so immediately we all had several idea's for the video. Firstly, we was influenced by one of Katy perry previous music video's called 'Your So Gay.' This video tells the story through barbie dolls cutting back to her singing every now and again. The idea of using dolls is quirky which shows the artists personality. 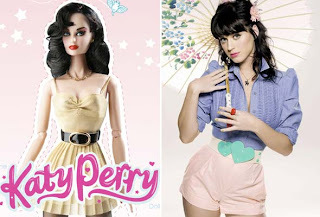 It also links to Katy Perry being seen as attractive artist with a perfect 'barbie' like image. This has been demonstrated with the release of her own Katy Perry Barbie doll.